Our kitty loves her new litter box enclosure and so do I. It is a great way to hide the litter box. I’ve places some decorative pillows on top and put it in the enterance of our mud room so we can also sit on it and remove our shoes when coming in from the garage. For those of us that have some big and tall furry friends, look no further! The Jumbo Designer Catbox is the larger version of our bestselling Designer Catbox. 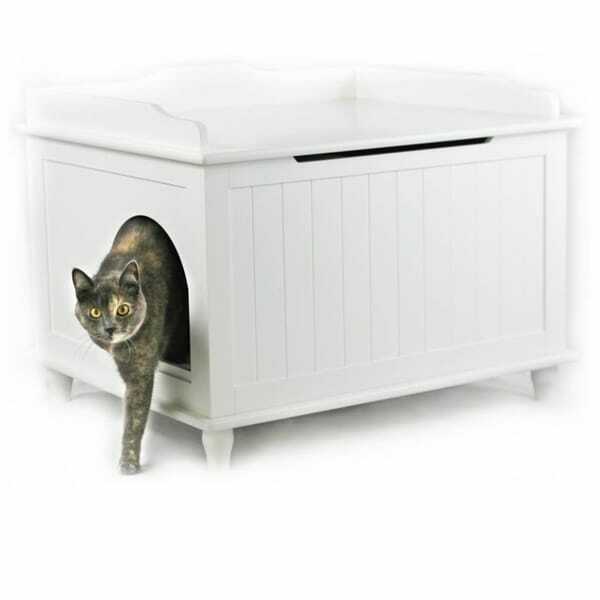 With extra interior height and added width, the Jumbo Designer Catbox looks like an elegant piece of furniture and is a stylish addition to any home while cleverly hiding the litter pan. The patented design of the Jumbo Designer Catbox features a removable interior panel that prevents litter from being kicked out onto the floor. If you decide your cat needs more room for a litter pan, simply take it out! Made with high quality wood pieces, the Jumbo Designer Catbox is a fully functional cat litter box with storage for your litter accessories. The litter pan, litter scoop and other accessories are completely hidden from family and guests. Also included is a hook to hold the litter scoop. The Designer Catbox is easily assembled and comes with detailed instructions. For setup, you will need a Phillip's head screwdriver. •	A removable interior panel and staggered entrance prevents litter from being kicked onto the floor. •	Outer hole can be set up on right or left, so that you can keep it hidden from guests. •	Double hydraulic safety hinge holds lid up for the easiest cleaning. •	Keeps curious children and dogs looking for "treats" away from the litter pan. •	Made from high quality wood and painted with durable, glossy, non-toxic, lead-free paint - made to last. •	Designed to hold most Jumbo or Giant litter pans. * Dimensions •	Size of the Jumbo Designer Catbox: 29.9" length by 22.8" width by 23.2" height. •	Shipping Weight: 56.2 lbs •	Cat entrance holes are 7.5" wide by 9.1" high to fit large cats. •	Interior dimensions of the Jumbo Designer Catbox are: 26.4" length by 21.7" width by 16.25" height. •	*The Jumbo Designer Catbox is designed to hold a standard or high- backed Jumbo or Giant litter pan. The space for the litter pan is 22.5" length x 17" width. Some brands that carry a litter pan that will fit are: Arm & Hammer, Petmate, VanNess, Doskocil, So Phresh, Pet Champion, and Grreat Choice. •	Note: a larger litter pan will fit in the Designer Catbox if you do not install the interior panel. Dimensions 29.9 In. X 24.6 In. X 23.2 In.